Music is something that means a lot to my family. Karl and I have attended several music festivals and I think the combination of music and roughing it has helped solidify our relationship. We regularly attend concerts and music is always playing in our home. 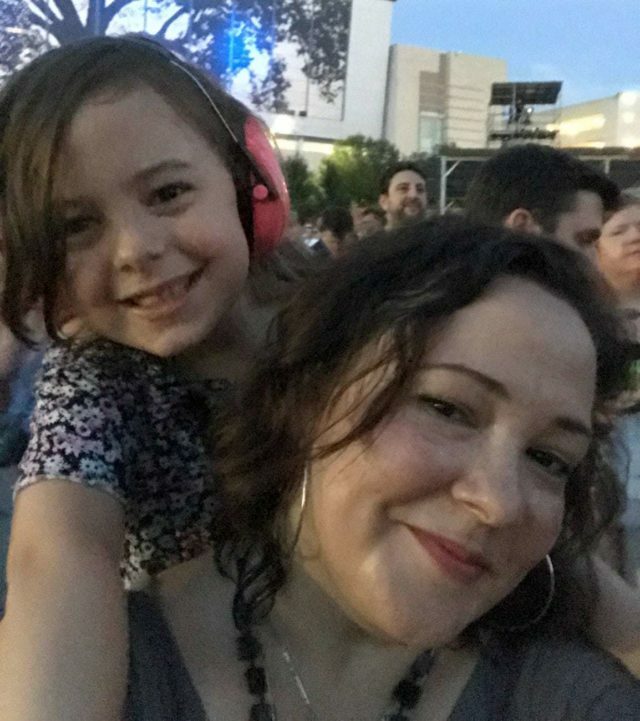 Emerson inherited our love of music; she’s always singing, loves playing the piano, and also is regularly playing music from her kid-friendly Spotify playlists. We’ve taken Emerson to nearby cafes for open mics and local music performances, but always thought that once she turned 8 we’d take her to her first bona fide concert. Our favorite band is My Morning Jacket and has been for over a decade. Their album Evil Urges came out the summer before Emerson was born and was the soundtrack to my pregnancy and her infancy (she was a Highly Suspicious baby). I even saw My Morning Jacket at Bonnaroo while Emerson was in my belly. So when deciding what first concert we’d take our kid to, it wasn’t a hard decision. The decision was where, and how. While My Morning Jacket would be coming to a venue near us, we thought it would be more fun to make this a true event and travel to another city. Also, this made it possible for us to see My Morning Jacket twice this tour, once as a family and once as a couple. Our goal was to make this a fun memory for Emerson. Last fall, I attended a music festival in Raleigh, North Carolina and loved the city. It’s easy to navigate, safe, great places to eat, cool things to do during the day for all ages, and I already had visited the concert venue and knew its proximity to hotels. It’s only a five-hour drive from DC, which made it a kid-friendly weekend road trip. 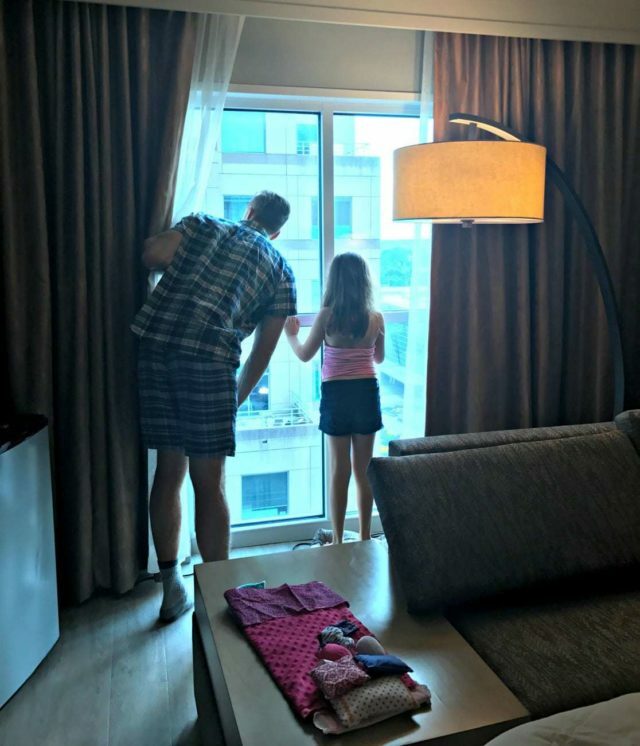 We booked a two-room suite at the Sheraton Raleigh Hotel so Emerson could have her own room and we parents could have a touch of privacy. The Sheraton is literally a block from Red Hat Amphitheater, the location of the concert so if Emerson got overwhelmed or fell asleep, it would easy to dash back to the safety and comfort of our hotel. 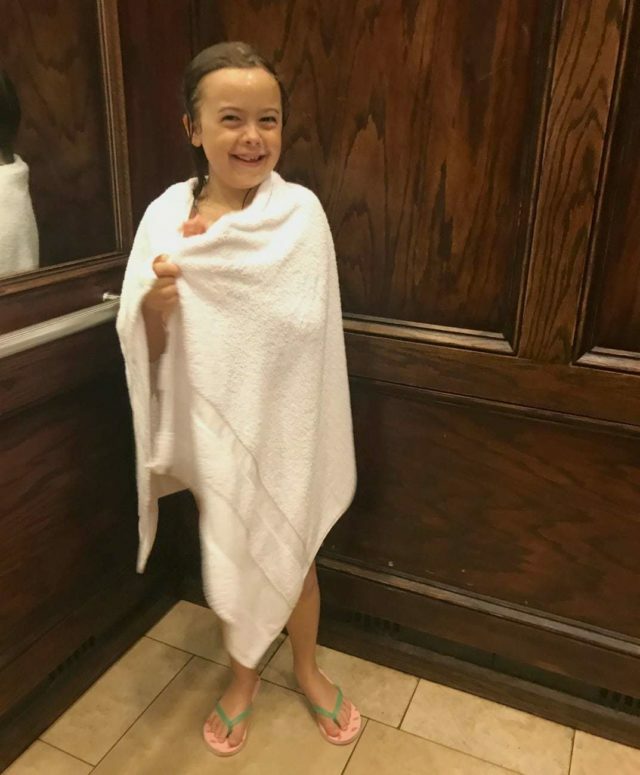 The Sheraton Raleigh Hotel was also a great choice because it has an indoor pool; Emerson LOVES to swim and I’ve learned over the years traveling with a kid that an indoor pool is better than an outdoor because it’s not as popular with adults and is a go-to when the weather turns foul. The concert was on a Sunday night; we drove down Saturday and arrived just before dinner, and just before a major thunderstorm. After the drive and unpacking, we had no desire to walk around in the rain and try to find a place to eat. 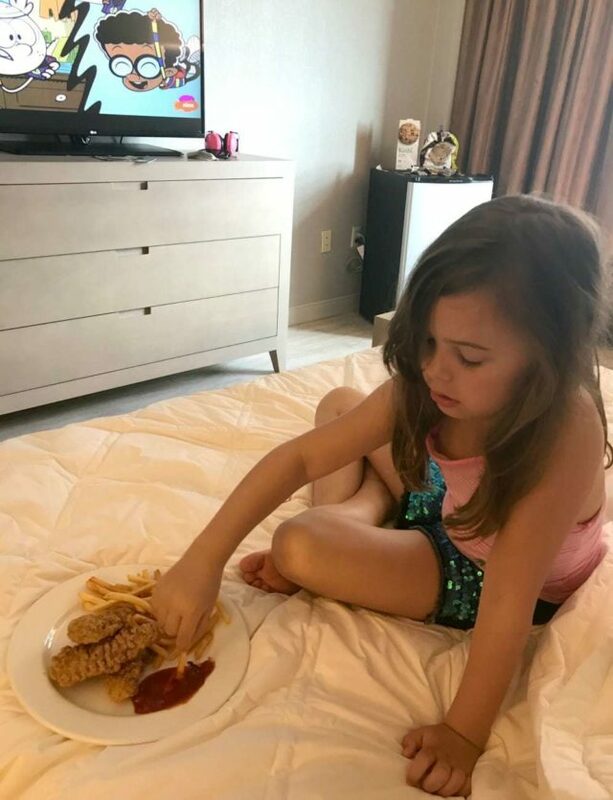 We decided to splurge and order room service… and were surprised to find the prices were cheaper than average restaurants at home. $6 for 4 giant juicy chicken fingers and a huge serving of French fries? Yes please! We didn’t want Emerson to go to bed early and wake early, so after dinner we went down to the pool and ended up being there for almost two hours. 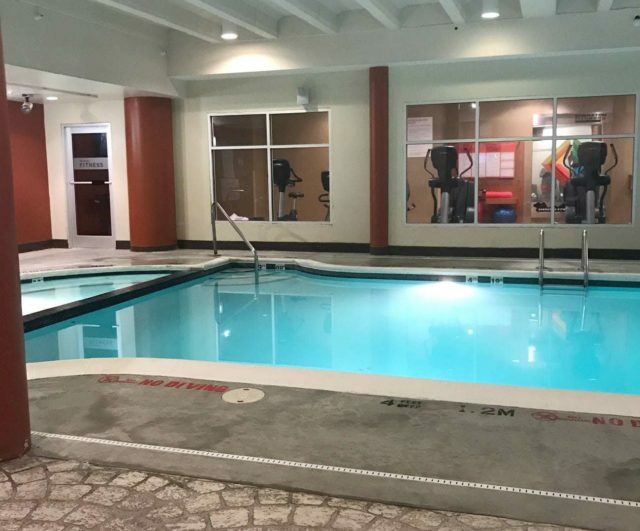 The pool wasn’t the gem of the hotel; it was a bit old and not well maintained but it had a hot tub, was large enough for laps, and for most of the time we had the place completely to ourselves. 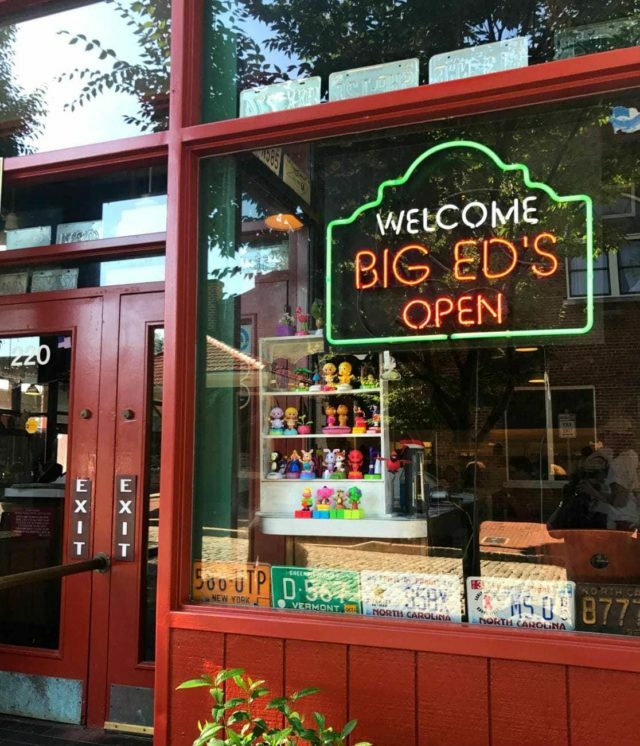 Looking for a family-friendly restaurant for breakfast, we came across Big Ed's City Market Restaurant. Like everything else in downtown Raleigh, it was a comfortable walking distance from our hotel. 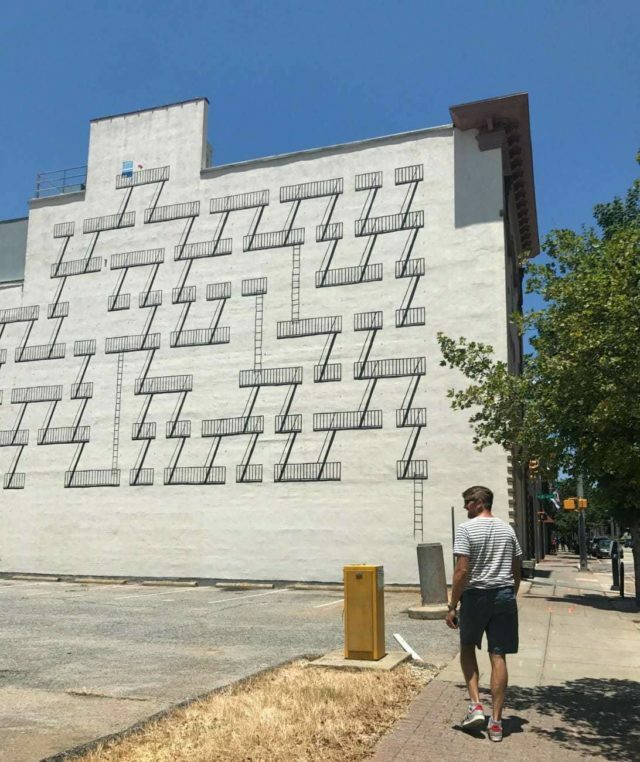 It's super cute and quirky and located in the Downtown City Market, a part of Raleigh I didn't visit the last time I was there. 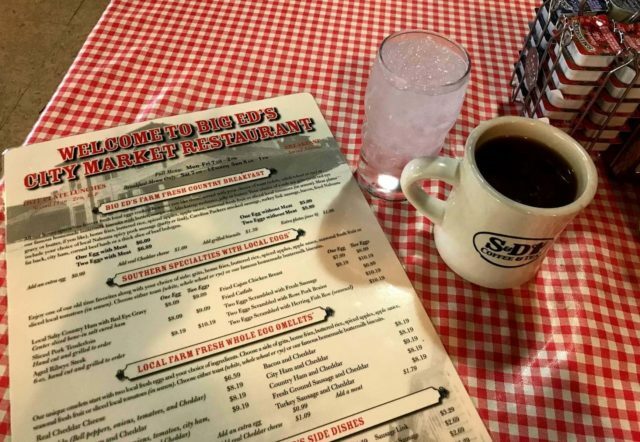 Not the place for a heart-healthy low-fat low-carb paleo clean eating breakfast, but it was delicious and the waitstaff was so friendly. 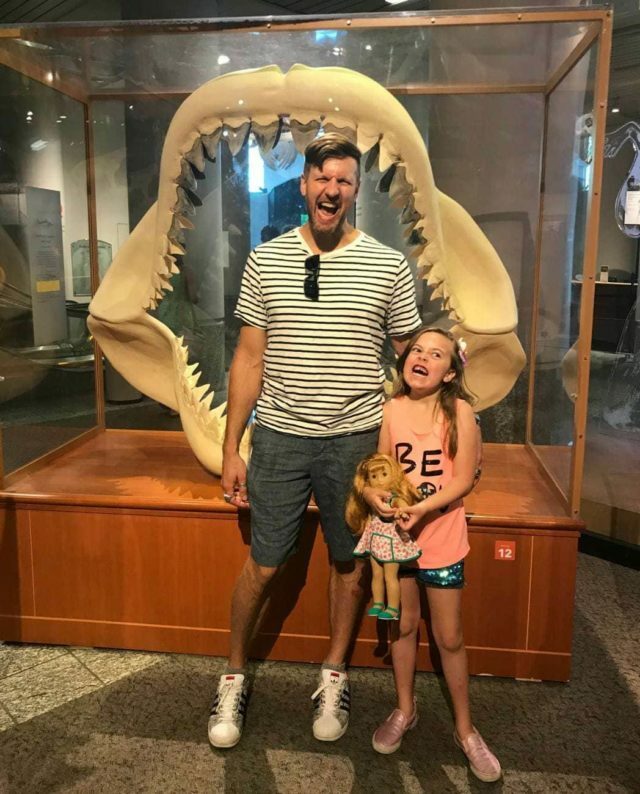 We did a bit of research and heard that the North Carolina Museum of Natural Sciences was really great and very kid-friendly. 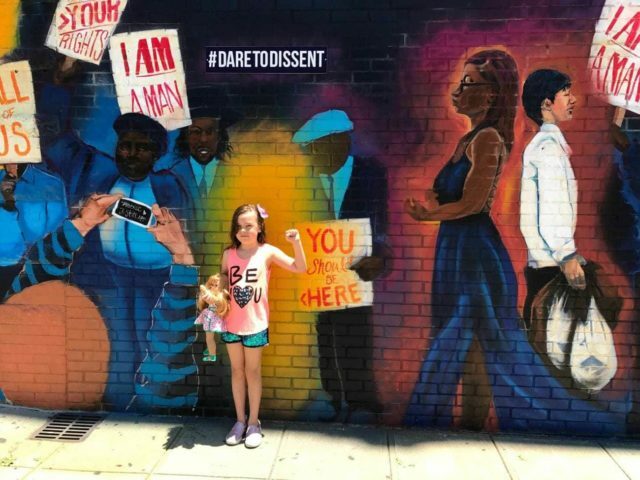 On our walk to the museum, we passed by a mural supporting the rights of protesters by Dare Coulter, commissioned by the ACLU of North Carolina. It’s a gorgeous and inspiring piece; after we explained to Emerson what it represented she asked to have her picture taken in front of it. The North Carolina Museum of Natural Sciences lives up to all of its glowing reviews. Upon entering (it’s free to visit), you see several examples of local wildlife. 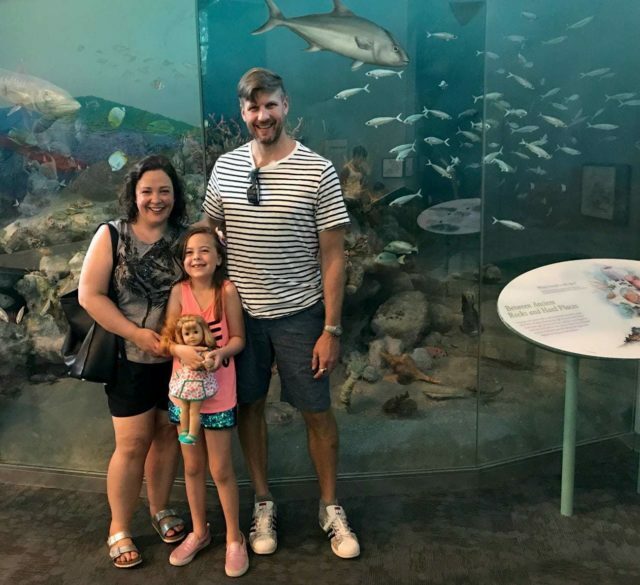 Travel around the museum and you see everything from examples of local stone to examples of local marshlands, aquariums full of fish and marine life, and interactive exhibits. We could have stayed there for hours, but around 1pm our stomachs started rumbling. We read that the cafeteria inside the museum was surprisingly good and decided to stay put for lunch. Again, the reviews were not wrong. We each got a fresh and delicious meal (I highly recommend the veggie burger!). Each kid meal comes with a small plastic figurine of an animal; Emerson got a sea lion and it became her American Girl doll’s favorite toy. Walking back from the museum, we passed the Briggs Hardware Building. Built in 1874, the building has had several different lives: hardware store, YMCA, church, armory, and office space. The main floor is now home to the City of Raleigh (COR) museum. 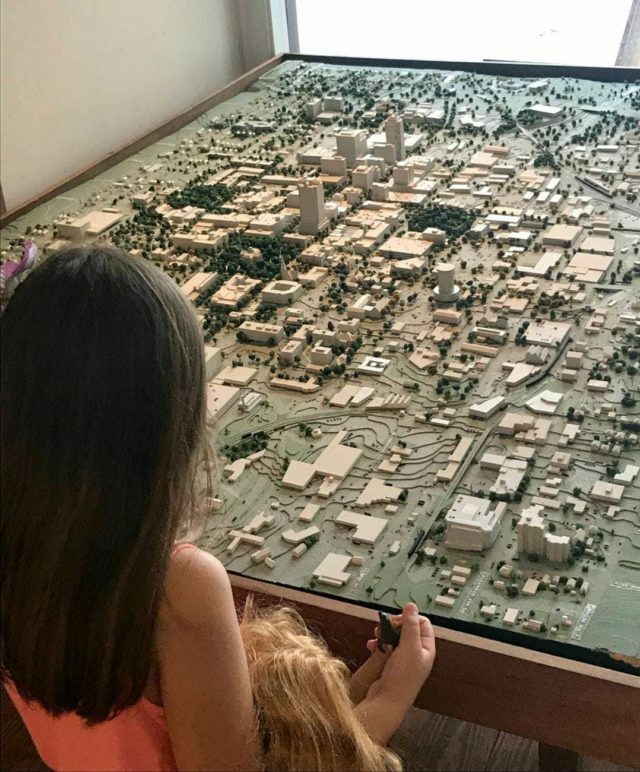 Emerson was instantly fascinated by the scale model of Raleigh and we spent a good half hour in there, me reading up on the city and she imagining being small enough to drive down the roads of Mini Raleigh. We knew the only way Emerson would survive a concert where the headliner started after her regular bedtime was to take a nap. We headed back to the hotel but Emerson was still full of energy. Back to the pool where we swam lots of laps and played lots of games of Marco Polo to wear all of us out. Back to the room where we took cozy warm showers, ordered some more chicken fingers, and all end up sleeping for a couple of hours. We woke up later than we expected, but decided not to rush. We got dressed, and headed down to the venue. Red Hat Amphitheater is an outdoor concert venue right behind the Raleigh Convention Center. Unlike large venues in the DC area, getting in was pretty easy. They checked in bags and pockets, but we didn’t have to stay in line and got there in time to see some of the opener, the genius that is Gary Clark Jr. Lines for concessions were long, but organized and moved relatively quickly. 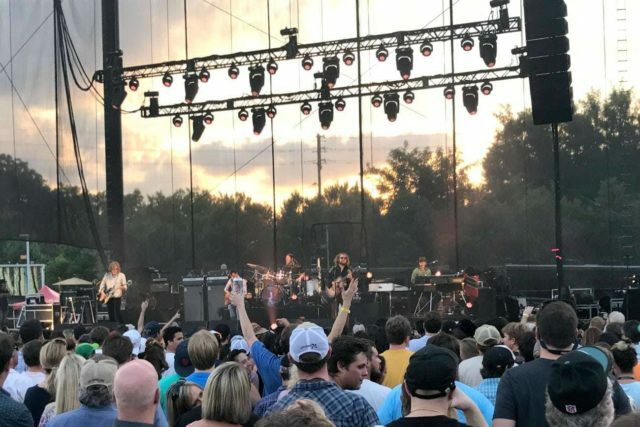 The audience at a My Morning Jacket show is usually friendly, but being in the south, we found the crowd even more friendly, accommodating, and laid back. I am a member of My Morning Jacket’s fan club (RIP Roll Call), so I was able to order tickets before the public. We ended up with third row seats in the center section right on an aisle. While I doubt there’s any bad seat at Red Hat, this was a perfect location for being there with a child: nor far from bathrooms, able to peek over heads at the edge of the crowd to see the show, quick access to the exit in case of a situation. Emerson came equipped with her headphones (we bought these for her when she was a baby, they still work great and likely will fit her for several more years) and a bag that had a couple small toys – some Littlest Pet Shop figurines, a fidget spinner, a note pad and pen. These were great for the time between acts to keep all of us occupied. We couldn’t bring outside food or drink but bought a couple bottles of water and hot dogs at concession. Emerson was not the only child at the show. We saw babies wrapped to their parent’s chests and backs, kids Emerson’s age dancing in the aisles, and plenty of tweens and teens with their moms and/or dads. While there were clearly many people enjoying alcohol and likely other substances, no one was unruly, aggressive, or obviously inebriated. We didn’t smell weed until way after the sun went down, and those around us were considerate of Emerson and if they were interested in doing such a thing, didn’t do it near us. The staff at Red Hat Amphitheater was phenomenal. They were on alert, but didn’t want to ruin anyone’s good time. Emerson was allowed to stand on the chair to be able to see the stage, they didn’t mind people dancing in the aisles as long as there was a clear path, and when people got out of line, they gently spoke to them and resumed order. Emerson was nervous about standing on the chairs, she felt it was against the rules, even when one of the staff told her it was okay. She swore she could see but I knew at my height I had to be just so to see the show between shoulders. She looked bored and sleepy and I was worried we wouldn’t even get through half the show. I finally just picked her up and put her on the chair behind me and wrapped her arms around my neck. Once she could see the stage is when she finally connected and realized how awesome a concert can be. 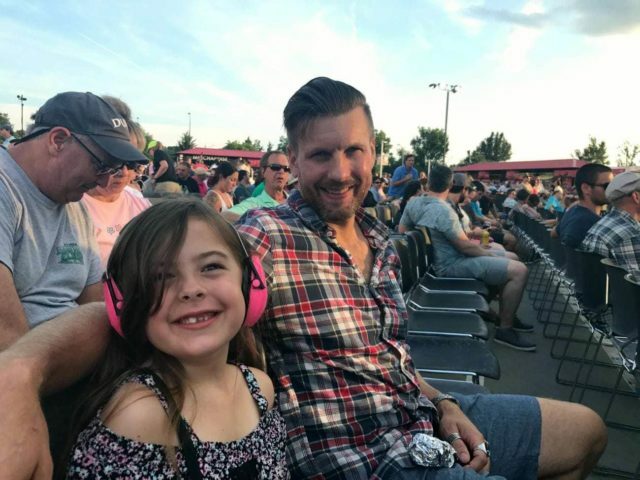 While it may be tempting to get the cheap lawn seats for a kid’s first concert, if you can splurge for closer seats it may make all the difference. Close seats for a pop star may cost an arm and a leg, but smaller artists at smaller venues may have close seats for little more than lawn tickets. Red Hat is such a cool location; as the band played a train went past behind the stage while the sun was setting. The night was warm but not too hot, there weren’t any bugs, and there was a light breeze. The sky was so clear we could see stars as the sky darkened. And as the sky darkened, the light show increased. Emerson was excited when she recognized songs, though was confused and bored by jam sessions and when they band switched up songs. It was a funny contrast to the diehard fans around us who were excited by very same things! It was clear Emerson was getting tired; her usual time to head upstairs for bed is 8pm and was turning into a pumpkin by 9:45 and the only thing that kept her going was hearing songs she recognized. When it seemed the band was finished with their performance she immediately asked us to go back to the hotel. We explained to her what an encore was and said it may be worth it to stay. She agreed that if she knew the song we could stay, if not we’d leave. The band came on stage and played Wordless Chorus. They turned on the disco ball hiding behind the stage lights and the whole amphitheater, all the people, and the convention center was covered in light. Emerson was in awe, her mouth dropped open looking at everything around her. But after the song ended, as we promised, we headed out. Emerson was sleepy and a bit grumpy but as we walked out she saw a glow stick on the path. She raced to it, and saw it had the connector to turn it into a bracelet. We hooked it onto her wrist and she was THRILLED. We as a family walked hand in hand back to the Sheraton, singing along to Touch Me I’m Going to Scream Pt. 1. Karl and I both sang, “I can see it by the way you smile, I'm smiling too, I see myself in you” and looked down at Emerson who was beaming between yawns. It was a late night, but such a great night. The next morning we got on the road and back home by the afternoon. We think we’ll make this a yearly tradition as a family; each summer a My Morning Jacket show in a different US city. It would be such a great way to see this country and get to know different cities a bit better while enjoying a band that is such an important part of our family. 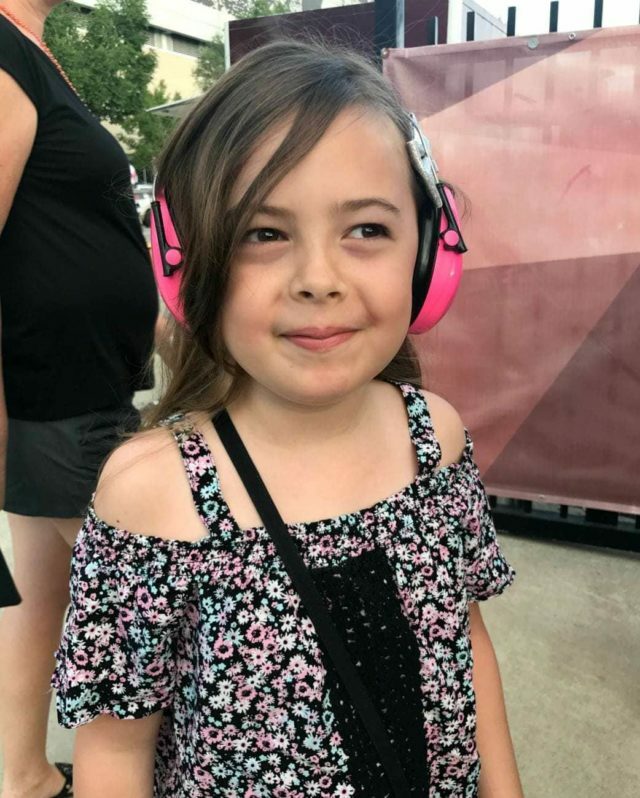 What is the Best Age for a Kid's First Concert? This really depends on your child. I've seen kids still in diapers rocking out at shows and attending music festivals, having a blast. Our child I don't think would have enjoyed it before the age she is now. We started small with local bands at cafes and venues familiar to her, leaving before it got too late. It was a great way to see how she reacted to the noise, the lights, the crowds. All the things that we adults find thrilling about a live show can be overwhelming, overstimulating, and terrifying to some children. You know your child best; be sure this will be a positive experience for her as well as you. If you’re attending a concert out of town, arrive the day before the show. Give your family a chance to get acclimated as well as plenty of sleep before a late night of music. Consider a Sunday Show. In most areas, shows on Sundays end earlier than those on other days of the week. We found this show ended before 10:00 while their show in Maryland the following Thursday ended at 11:00. Take a Nap. Not just the child, the whole family. Not only will the nap help your child stay awake later, he or she will also be in better spirits. And parents, take a nap as well so you too are in better spirits. It’s a lot easier to deal with a grumpy or overwhelmed or overly excited kid in a crowd when you’re well rested. Get ear protection. These headphones from Peltor are comfortable AND cute. Emerson feels cool wearing them and we feel good knowing her hearing is protected. Bring Distractions. There’s gaps of time between sets. Mad Libs, a fidget spinner, a notepad and pen for hangman and doodling are all great things to use. I do NOT recommend bringing a tablet or other electronic device to entertain your child. Even when music is playing the venue will be loud. Also we all know that electronic devices can be too entertaining and it’s hard to detach a child from them when the music starts or when connecting with others in the audience. Plan for the Worst, Hope for the Best. We went in knowing there was a good chance she’d want to leave after one song. And together we agreed if that happened we’d leave. Sure, it’s our favorite band. Sure we traveled a long way and paid a lot for our tickets. But what a horrible experience for Emerson if we forced her to stay. Between sets we went to the bathroom, when there was a jam session we again visited the bathroom even though she thought she didn’t need to so we wouldn’t have an emergency in the middle of our favorite song. We made sure Emerson had a card safety pinned in her shorts that had our first names, cell phone numbers and an emergency number besides us in case we got separated. We also took a picture of Emerson that evening on both of our phones in case we got separated so we had a super recent image showing what she was wearing. We introduced ourselves to the staff near our section so Emerson was familiar with them in case we got separated and they knew she belonged with us and no other people. It’s awful we have to think this way, but it’s better to be safe than sorry no matter how friendly and chill the situation. Stay Sober. Refraining from alcohol and other substances is a good idea for a multitude of reasons. You’re staying sharp so you’re at your best if an emergency arises. You’re showing your child that even though there’s people under the influence at shows, it can still be a blast without being inebriated. It also puts you in a good light with the staff so they are more likely to make accommodations for you and your child (let you move up, stand on chairs, maybe even invite you backstage). Have an Exit Plan. It’s easier to walk a long distance into a venue than a long distance from it. It’s easier to deal with an overtired child in your car than walking through a parking lot. When arriving at the venue, consider these things when parking. Maybe you arrive extra early and have a relaxed picnic dinner in the venue before others arrive so you can park near the exit. Maybe you choose to stay in a hotel walking distance from the venue so you can be from concert seat to bed in a jiffy. We all know kids can go from chill to complete meltdown in the blink of an eye, especially when overtired and overstimulated. 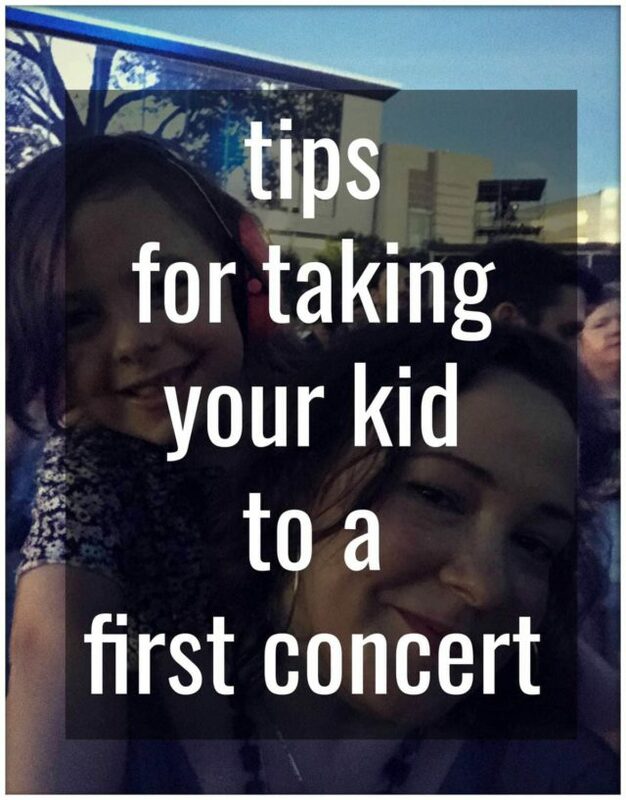 Being prepared can help ensure your child’s first concert is an experience they will always treasure. That picture of you with Emerson on the chair behind you/around your shoulders is amazing!! What a great family experience! Your tips are really good too. My husband & I have always had the agreement when traveling with our son that we never overplan or overextended ourselves. Even when we took him to Disney World at 5, we knew we would not see & do it “all.” I have to say that almost all of our family vacations have been fantastic b/c of this, and our son is a fantastic traveling companion! Way to go guys! Emerson is now instantly cool to anyone who hears she went to her first concert when she was 8. We moved to the Raleigh area (my husband’s home town) a year ago & are really liking it! Glad you did too. Our boys have been going to concerts since they were 2 years old – starting with Bruce Springsteen. It is what we do as a family! They are now 16 and 20 and we just drove from Winston-Salem NC to Philadelphia to see U2 over Father’s Day weekend. Next up is Kendrick Lamar next week, and yes our tastes in music are very eclectic. YES! YES! YES! All of the above! We, too, are a family with a love of music. Our now almost 16 year old son could sing before he could talk and has perfect rythem. We were always taking him to small local things and a handful of Christian concerts/music festivals when he was small. When he was 10, we went to the Gentlemen of the Road Music Festival with Mumford & Sons. 2 days of music and mayhem. We camped and on the first night we were on the stage rail for Edward Sharpe & the Magnetic Zeros. Like your experience everyone around us was mindful of the kids (there were lots of them) and he was absolutely in awe. Now he drags us to every concert possible and we are happy to oblige. It’s hands down one of our favorite family memories.